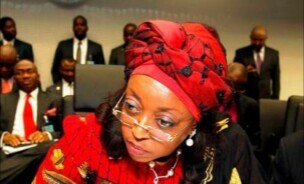 A court in Abuja has ordered the temporary seizure of property worth $37.5m (£29m) belonging to former oil minister Diezani Alison-Madueke on the suspicion that it was bought with ill-gotten money, the AFP news agency reports. The seizure is part of a series of cases brought by the Economic and Financial Crimes Commission (EFCC). The property is an apartment block on the upmarket Banana Island in Lagos. Ms Alison-Madueke is currently on bail in London where she was arrested on corruption allegations. She was oil minister under former President Goodluck Jonathan from 2010 to 2015.